USD has been supported by the hawkish comments made by Richard Clarida. 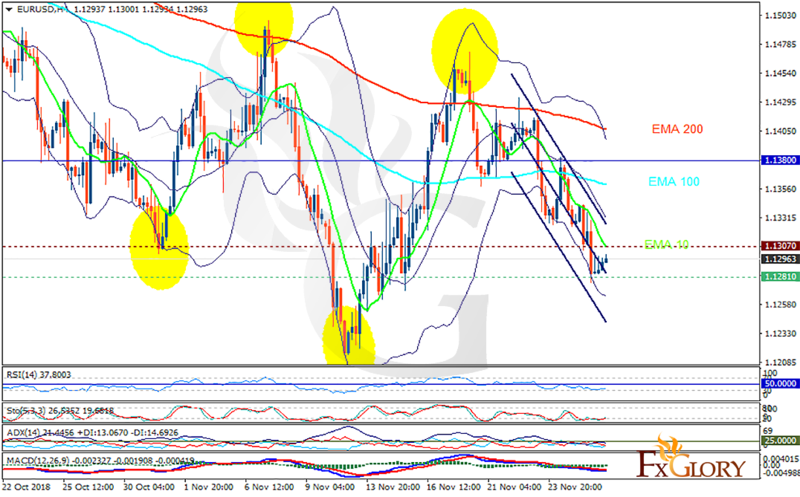 The support rests at 1.12810 with resistance at 1.13070 which both lines are below the weekly pivot point at 1.13800. The EMA of 10 is moving with bearish bias in the descendant channel and it is below the EMA of 100 and the EMA of 200. The RSI is moving in the oversold area, the Stochastic is moving in low ranges and the MACD line is below the signal line in the negative territory. The ADX is not showing any clear signals. It seems that the pair is trying to consolidate within the lower part of the Bollinger band.